There’s nothing more joyful to me than coming home to a deskful of sweet treats or baking supplies. When I went home last week to take care of family matters, I was anxious, nervous, and coming down with a cold from the hectic pace of things that have been happening around here lately. But while I won’t deny that it’s been a stressful past few months, things are finally looking a bit brighter, especially on the home front (fingers crossed)…which is why I’m back at baking and blogging! And today, I’m excited to share a new favorite discovery of mine with all of you. When I returned from the Bay, I found two lovely, huge packages waiting for me on my desk. The first was an Australia Day care package from Marty, the incredible soul from Perch whom I had met at the Riverdance in Dublin (you can read about our first meeting here!). It containsed Tim Tams, an adorable kangaroo plush, Vegemite (still haven’t given this one another try…), a hilarious phrasebook of Aussie slang, a bunch of other quintessentially Australian snacks, and a full-sized Australian flag! The second was from the lovely folks at OXO who, to be frank, might very well be some of my favorite people in the world. 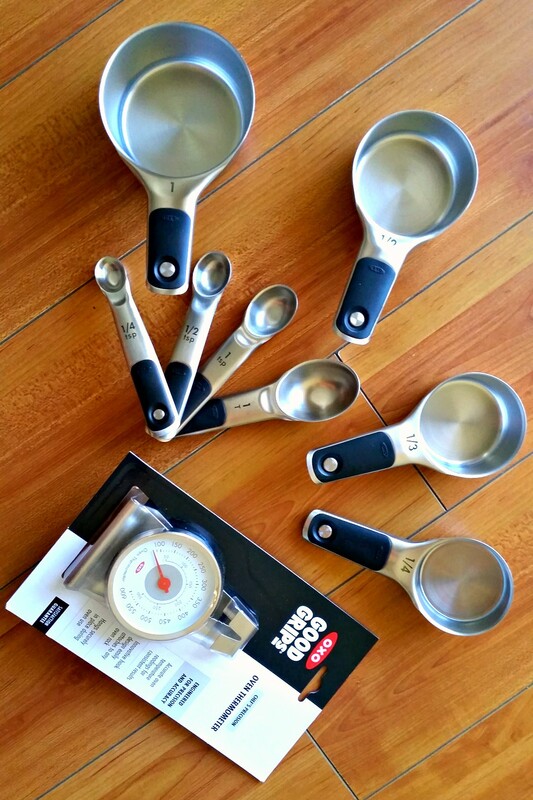 As always, their box was filled with a bunch of high-quality baking items, including an optimized 360-degree air circulation cooling rack, a secure-grip-handle quality loaf pan, a stable oven thermometer, and a fancy magnetic set of measuring cups and spoons. 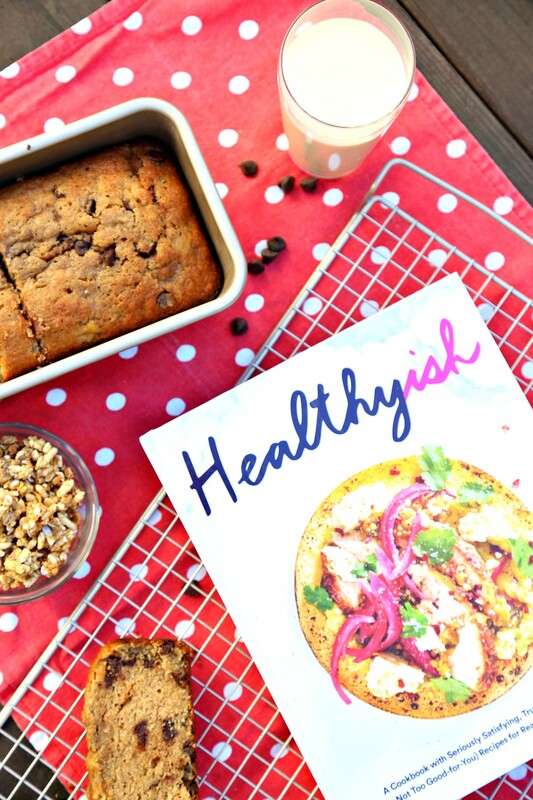 Even better, they sent me this cookbook called Healthy-ish from Lindsay Maitland Hunt, and that’s where I found this recipe for Whole Wheat Banana Bread that become an instant hit in my office! Thanks, Lindsay! What I love most about this recipe is how extra-simple it is to make. 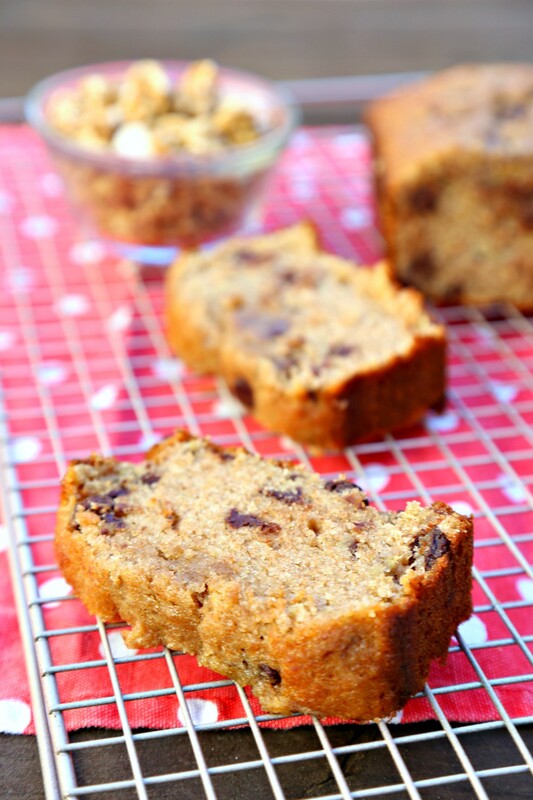 When I got back from the Bay, I was hardly in the mood to pore over recipes, melt butter separately, and all that other stuff that sometimes makes baking a real chore–but the ingredients for this banana bread are easy to handle and seriously just require throwing everything in a big bowl and mixing. Couple that with my giddiness over all of the new OXO gadgets that I got to test out, like the easy-clean Non Stick Pro Cooling and Baking Rack & Non Stick Pro 1 lb. Loaf Pan, a Chef’s Precision Oven Thermometer that doesn’t slip inside the oven, and Stainless Steel Measuring Cups and Spoons that click together at the handles through magnets…and I definitely feel at home again in my kitchen! Sometimes, it really is great to come back to a welcome like this. The coming weeks still promise to be extra-busy, but if you’re feeling the same way, you might want to make this Extra-Easy Whole Wheat Banana Bread to compensate. It’s guaranteed to brighten your day a whole lot more, just like it did with mine! For more baking ideas, and to see some of the supplies that I’ve featured here, visit Oxo.com. 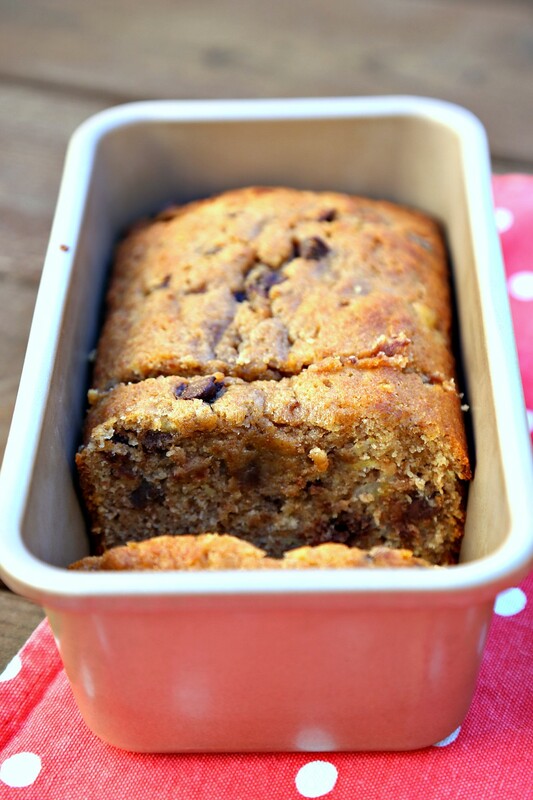 This Extra-Easy Whole Wheat Banana Bread with Chocolate Chips is the perfect treat for the beginning baker. Filled with wholesome ingredients like whole wheat flour and ripe bananas, this recipe requires only one bowl and minimal brainpower to create. Sub in healthy extras such as walnuts, sesame seeds, and poppy seeds for an extra-healthy kick! 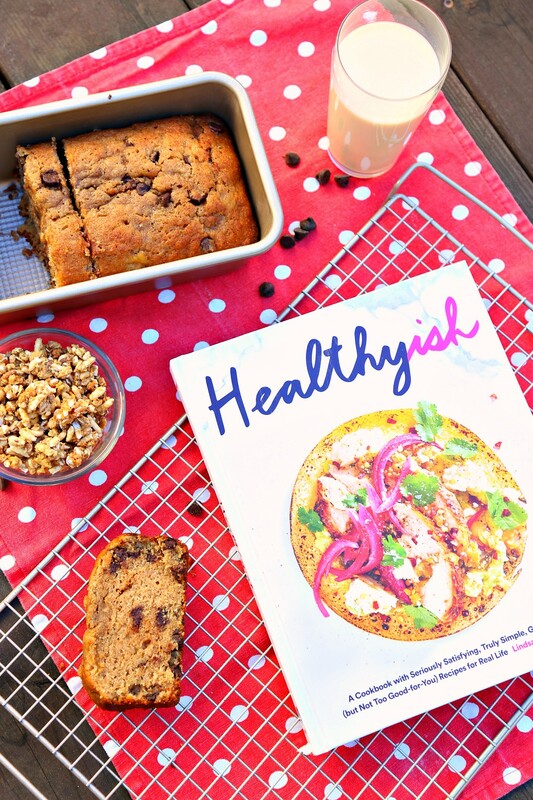 Recipe adapted from Lindsay Maitland Hunt's Seeded Whole Wheat Banana Bread from "Healthyish." Preheat oven to 350 degrees F. Lightly grease a 8 1/2 x 4 1/2-inch loaf pan and set aside. In a large bowl, mix together bananas, eggs, oil, and vanilla extract. Gently add and fold in flour, sugar, baking powder, cinnamon, and salt. Fold in chocolate chips. Pour batter into prepared loaf pan and bake in preheated oven for 45-50 minutes, until a toothpick inserted in center just comes out clean. Transfer to a cooling rack and cool completely before inverting and slicing.